Equipped with a diamond-edged masonry blade, many standard, portable circular saws are capable of slicing through stone and concrete paving stones. However, most general-purpose saws cannot cut entirely through stones several inches thick. 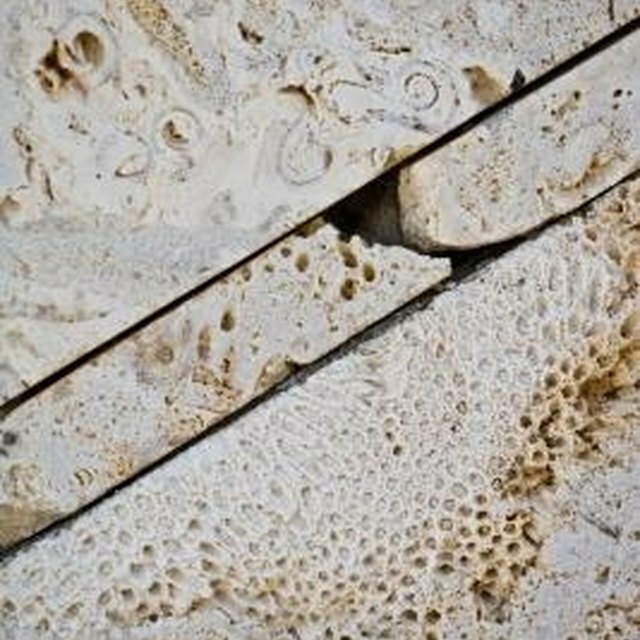 To use a standard circular saw to cut thick paving stones, builders score a stone's surface with the saw blade and strike the stone with a sledgehammer or maul to sever the stone along the score. Cut paving stones to achieve a clean look around drains. Lay the patio stone in the desired position. Mark the stone's surface with a lumber crayon or wax marking pencil to indicate the path of the cut. Marking the cut lines with the stone in position ensures accurate layout. Flip the stone over, reposition the stone and mark corresponding cut lines on the stone's underside. Soak the stone in a bucket full of water for approximately five to 10 seconds to reduce dust during cutting. Set the circular saw's depth of cut to 1/4 inch. Place the stone on the ground in a flat area. Activate the saw and run the saw blade through the cut lines on one side of the stone. Flip the stone over and cut across the lines on the opposite side. Increase the saw's depth of cut by approximately 1/8 inch to 1/4 inch and make a second run through the scored lines. Increase the saw's depth of cut another 1/8 inch to 1/4 inch and make a third pass through the scored lines. Hold the stone in a flat, stable area on the ground and strike the waste portion of the stone with a mini-sledgehammer or maul to sever the stone along the score; do not strike the portion of stone that you wish to install. Wear safety goggles and a dust mask. Always wear long sleeves and pants when cutting masonry materials; chunks of stone tend to fly during cutting. Will Cut Lemons & Acidic Foods Damage Granite Counter Tops?